I first heard about Sarah J. Bradley when she called in to a popular Milwaukee morning show to answer questions for a trivia contest. In the meantime, she talked about being an author. She called in a couple times (a very diffiicult set a questions fittingly called “You Still Can’t Win“) and each time the morning DJs talked to her about her book. They even had her on once the book was finished. To me, this is great marketing at work. When you’re an author, even when you don’t think you have an opportunity to promote your work, you do. You never know how one thing can build on the next. After hearing Sarah on the radio again, I had to interview her! I know you’re going to love her answers. Enjoy this interview. I’m an Upper Midwest girl. I’ve lived in Minnesota, Michigan, and Wisconsin. I currently live with my husband or almost 20 years, and my two teenaged children in Southeastern Wisconsin. I’ve been writing since I was seven. I believe my very first attempt at writing was “A complete History of the Civil War.” It was six sentences long and I illustrated it myself! 🙂 In grade school I had a couple stories published in the local newspaper, but I really started writing fiction in high school. Tell us about your book, Dream in Color. What do you hope readers take away from it? Dream In Color was inspired by the women I’ve met through the many online fan groups I’ve joined over the years. My two biggest celebrity crushes are Rick Springfield and Randy Mantooth (From Tv’s “Emergency”) and some of what transpires in the book actually came from things I learned through those fan groups. My heroine, Ramona, is sort of an “Everywoman” who faces pretty much all of the frustrating bumps all women face in life. But what keeps Ramona from spiraling into a morbid depression is her big dream. Right now I’m working on a series of novellas that I hope will serve to pave the way for my second novel, Lies in Chance which is a romantic suspense I’ve been marketing. I always ideas rattling around in my head, so there’s never a lack of things to work on…just sometimes the lack of discipline to sit down and write! Wow, great question! The House on the Strand by Daphne Du Maurier. I read it at a fairly young age and the concept of using hallucinogenic drugs to time travel really stuck with me. I’ve read that book several time over the years and it never fails to keep my attention. The Bronte sisters, of course, and Daphne du Maurier. More contemporary authors, I love Stephen King’s most recent work. I’ll read anything Phillipa Gregory and Adriana Trigiani set out. For a laugh I always turn to Jennifer Cruise. As a child my favorites were Judy Blume, Beverly Cleary, and Joan Aiken, who really put me in touch with the dark side of writing at an early age. Of course, the person responsible for planting the writing bug in me is the late, great Erma Bombeck. Reading her column in the paper every day after school inspired me to put down my thoughts. When my children were younger, I actually published a couple stories about being a young mother. Whenever anything I write gets too dark, I think, “What would Erma say here,” and I’ll generally come up with something humorous. Right now I’m reading Love ‘Em or Leave ‘Em , a first novel by my friend Angie Stanton. Up next on my nightstand is Brava Valentine , which is Adriana Trigiani’s newest. I don’t have a set ritual, generally. If the spirit moves me to write, the look out! I set everything else aside and do it. Sometimes that annoys my boss. 🙂 I think the one thing I do is I create a soundtrack for the book as I’m writing it. I’ll hear a song or a singer’s voice that fits with my characters or story, and I’ll make up a playlist on my Ipod. I love my Ipod! For Dream in Color, it should be zero surprise to anyone that the soundtrack is made up of Rick Springfield songs. His most recent CD’s really captured the vocal sound I heard in my main character, Jesse. I completely believe in writers’ block! It’s not always a mental thing, though. Sometimes writers let their real lives block their writing because, well, it might not seem that important. The only reason it took me six years to write Dream in Color is that I didn’t work on it for about four years. If you get into the rhythm of writing frequently, you probably won’t lose the flow of your story, which is the biggest reason for that mental block. When I’m really, really stuck, when I’ve written a deleted and written and deleted and nothing seems to come, I go back to the very first novel I started, back when I was thirteen. I know those characters so well, and I have no problem changing this or that in the storyline. Just the pure act of working on that project will sort of jolt my brain into my new project and get me back on track. It’s rather odd, pushing through a block this way, but it works for me. For others, the definition of success might be something else. Some might need that big contract before they feel successful. For some, the process of finishing a story is the key. The act of writing is hard work. The act of getting published is even harder in terms of the rejection rate. I don’t consider anyone a failure if they’ve finished that story and submitted it and gotten a hundred rejections. Every NO is a step closer to a YES. I applaud any writer who refuses to give up. I once watched a TV show…and for the life of me I don’t remember what it was, but it involved a writing class and the last thing the teacher said was, “Remember, a writer writes…always.” That has stuck with me since I was a teen. Just keep writing. No one can read what isn’t written. Oh, I’m all over the web, it seems! I have my own website. I have a myspace page and I have my blog . I’m on facebook all the time it seems, and if there’s big news I’ll hit facebook first. 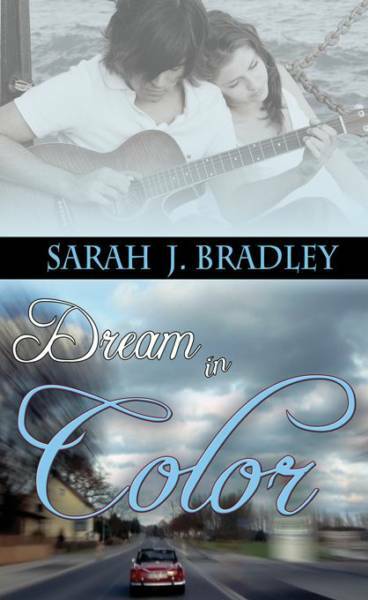 Dream in Color is available through the Wild Rose Press. I will be at the WisRWA conference May 14 and 15, and I’ll be doing the book singing on the 15th, so if you’re in the Milwaukee area Saturday afternoon, stop by the Brookfield Hotel and Conference center Saturday afternoon and say hi to a lot of local authors. All proceeds from that book sale go to literacy programs in the Milwaukee area, so it’s a super cause! Cherie, this has been a blast to do! Thank you! Everyone else, support your local bookstores, and your local writers. And if you’re a writer, keep writing! Be the first to comment on "Interview: Sarah J. Bradley"